Jal cooper in his book, Early Indian Cancellations (Thacker & Co., Ltd. Bombay, 1948) has classified Type 3 cancellation as an extremely rare cancellation. According to Jal Cooper, only one example of this had been recorded on a blue Scinde Dawk, which was collection of Mr. C. D. Desai, F.R.P.S.L. ( Ex : Panthakey ) One more example of this cancellation on HALF ANNA lithograph stamp was also in the collection of Mr. Desai. According to Jal Cooper further examples of this cancellation has not been reported or seen by him, in this example, the diamond Shape cancellation consists of Parallel zigzag bars and triangular dots are found along the outer lines to make the sides even. The diagonals measures 26 mm. and 20 mm. 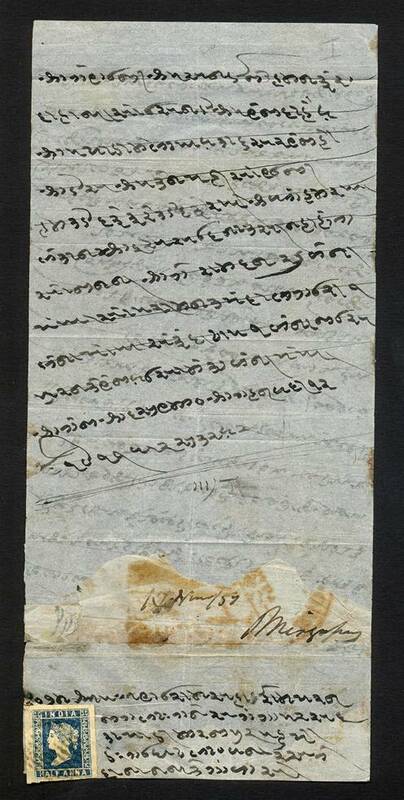 I would like to report a discovery of Jal cooper Type 3 cancellation on a 1854 HALF ANNA DIE I on a local letter sheet from MIRZAPORE written in Gujarati. 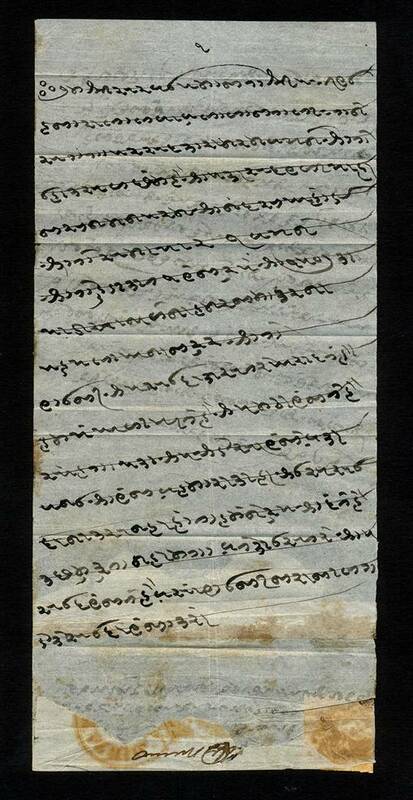 The letter sheet is dated 17 November, 1859. 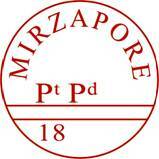 MIRZAPORE Pt. Pd (Post Paid) in Red CDS but Giles listed as Black (1823-37 circa) another HandStruck stamp on reverse is Giles Type 2. In a trisected box MIRZAPORE PAID Gile Type 5 (1838-50 circa) in red, but very faint, as usual for this period when red ink was used. 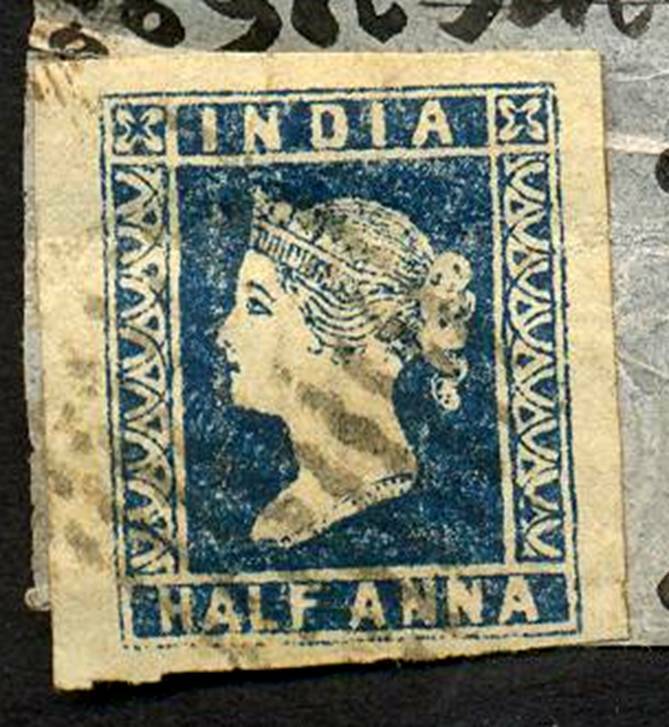 I Observed that there are 2 different fashions of cancellations on Blue Scinde Dawk & Half Anna Stamp accordingly, this cover is cancelled in the same fashion of the Half Anna Stamp illustrated in cooper’s book. I consider this is a rare discovery in the sense that Cooper Type 3 cancellation found on a lithograph HALF ANNA stamp on a cover from MIRZAPORE used as late as 1859. Thus this discovery adds one more example (i.e. total three) of Jal Cooper Type 3 cancellation, that too on a cover. 3rd & 4th Wavy Lines from top of the cancellation are Broken & the Waves are not Sharp probably due to late Usage.